Author Marion Nestle describes the politics of our food choices, and encourages us to participate in creating a healthier food future. Why have food choices become so confusing? Marion Nestle: I’d say it’s because of the way food companies market their products. Basic dietary advice hasn’t changed much in the last 60 years. It still says to eat lots of fruits and vegetables, balance calories, and not eat too much junk food. Those are the basics. But everything else is about selling food products. My vision of a healthy food culture is one in which marketing is restricted to describing the products, and there are no health claims (they are all misleading) and no marketing to kids (it’s unethical). 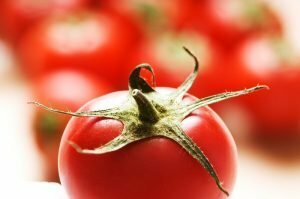 How does the food industry influence our food choices? Marion Nestle: The food industry influences us through advertising and marketing (why would they do it if it didn’t work? ), lobbying to make sure no government agency says to eat less of its products, co-opting nutritionists and health professionals so they won’t criticize the products, criticizing scientific findings to confuse the public, and blaming obesity on personal responsibility and not enough physical activity. How can individuals help build a healthy, sustainable food system? 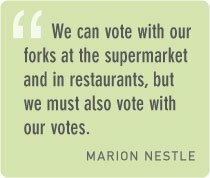 Marion Nestle: We can vote with our forks at the supermarket and in restaurants, but we must also vote with our votes and exercise democratic rights as citizens. If we want a healthy, sustainable food system, our political system needs to align agricultural policy with health policy. Education can play a role in making healthful food choices, but only as a first step. It takes more than knowledge to change behavior. That’s why it’s so important to change policy to make it easier for people to make those healthful choices. Marion Nestle: It’s one place where political action can have immediate, positive effects and make life better for lots of people. You may not be able to do anything about the wars in Iraq or Afghanistan, but you really can get healthier foods into schools and into your families’ lives. It’s a place where one person can make a difference, and an important one. And you get to eat the results of your work! Marion Nestle is Paulette Goddard Professor in the Department of Nutrition, Food Studies, and Public Health, and Professor of Sociology at New York University. Her degrees include a PhD in molecular biology and an MPH in public health nutrition, both from the University of California, Berkeley. She is the author of Food Politics: How the Food Industry Influences Nutrition and Health; Safe Food: The Politics of Food Safety and Health; What to Eat; and other titles. Visit www.foodpolitics.com.